What is Irish by Heart, exactly? Irish by Heart is a blog about sustainable traveling, local produce and you, the people. Irish by Heart looks at food production in certain areas around Ireland. People tell their stories, Lucie writes them down. To be honest, I was there to get some coffee. But then I sat down in this beautiful building just around the corner of the Red LUAS line at Blackhorse, Dublin and looked around me. This is an old building, but I couldn’t figure out what story it wanted to tell me. After finishing my coffee and chatting away with the only customer but me, a family and military researcher, Thomas, who also reminded me of why I loved the Irish so much. Thomas was given a photograph of a British soldier which’s features could not have been closer to Thomas’. Since then, Thomas is doing major family research in genealogy to find out more about his family. I was pleased to hear one family’s story before I headed into the history of the building which remained to be here. Fortunately, I must say. Because every building but three has been knocked down on the 17,000 acre field. So much history just went with that. But I suppose it was necessary. 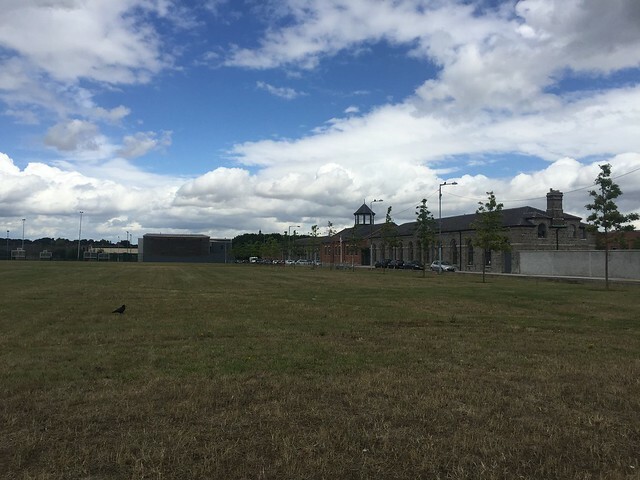 The Richmond Barracks, now part of the Dublin City Council, are a former military base for the British Army stationed in Ireland from 1814. After the Easter Rising in 1916, and after the Free Irish State was founded the Irish Army used the buildings until 1922. The most interesting fact about the barracks is that more than 3,000 suspects of the so-called Easter Rising were behind bars there. Including every leader except James Connolly. It was mind-blowing to read and to hear all about it. 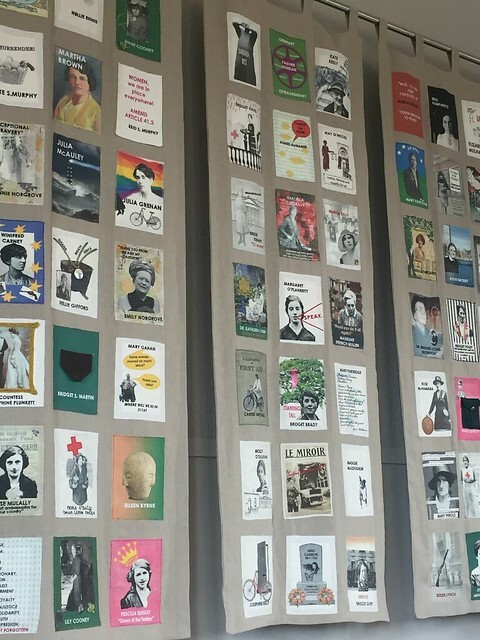 Exceptional work has been done in the research concerning women in the revolutionary years. 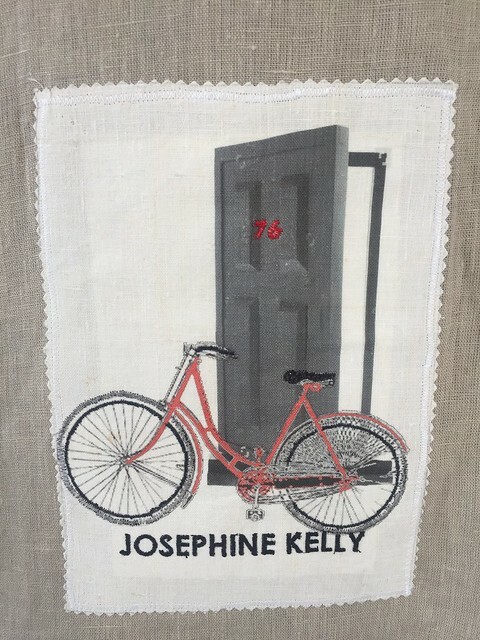 In the recent exhibition called The Digital Quilt 77 women of the revolution are represented with their attributes on a three piece quilt. 77 contemporary female artists worked on the women’s stories and put it together to an extraordinary wall piece. The histories of the women all crossed the arches of Richmond Barracks since they were arrested and held at the barracks in 1916. I could not resist and bought the book about the 77 women to get to know history from another perspective. Or better: from more perspectives than just one. Visit the graveyard next to the canal. Don’t hesitate to ask your guide for advice or more stories. Niall was very happy to tell me more about the barracks, the women’s stories and the museum itself. Five years ago, I addressed the wish to myself to live abroad for a while. I knew it would be Ireland, somehow. A few days back, I was asked if Ireland was a particular choice. Yes. I am interested in its richness. The growing awareness of how food should be processed is equally important in Austria. But, I appreciate the Irish way of patience, lust of life and immorality to deal with topics like sustainability and green living. When I listened JP McMahon, Chef, Writer, and Founder of Food On The Edge, and Dr. Máirtín Mac Con Iomaire, Chef, Lecturer and Ireland’s leading food historian, on With Relish, an Irish food podcast, I was struck; this is what I wanted to write about, this is what I wanted to dig in deep, to know more of. What are we coming from? What have we eaten historically? How did it shape us? I like Máirtín’s description of the summation of food that we have eaten on this island historically until now. It is like digging deep in archaeological findings. He asks us to use our imagination and experience finding oyster shells out there at the coast. In ancient times, there was an engagement with food. With actions taken like JP’s festival Food On The Edge at least chefs and their acquaintances are drawn to a culinary focus again. Five years ago, I shaped a dream which I follow now. It is never too late. And there is always a dream to find yourself to wake up with. I am right in the middle. Come join me. This year, in 2018, Food On The Edge will take place on October 22 and 23, in Galway. My second home is and always will be Ireland. The Emerald island. Sheep. Rain, always. People, which could not be more friendly. Music, all over the place. In Ireland, I went through moments in which background music was played, for real. Like in a film. A great one. I remind you of “Once” or the Klischee tragedy “P.S. I love you”. Home is where your heart is. Definitely, Ireland. Cattle. Yes, it seems there are more cows around than sheep. Father Ted is an institution in Ireland. I have never really understood the jokes, but I traveled to the place where it was shot. Mid-Western parts of Ireland around The Burren. Green grass, small houses and water. This is Ireland. Too. When you hear the music ringin’ in your soul, and you feel in your heart, it grows and grows. It came from the backstreet Rock and Roll And the healing has begun. That’s where it come from man. The Irish lifestyle accompanied me in the last ten years. I am talking about the “Take it easy” and the mostly incorrectly but comfortable time adjustments like “I’ll be back in a minute” which made me very uncomfortable in the beginning. But I opened up after a while living in Ireland and I could sit back to forget about my own discipline. Irish music has been part of my life since then. Caladh Nua, for example, is a young Irish band I have listened to in 2014 in Krems, where I used to live. I love diversity in its playfulness and the instruments about Irish music. I am fascinated about the passion to make music. Whenever you enter a pub in Ireland there is live music, maybe a guitar player who sings about life but also appears to be a philosopher talking melancholy. Tradition and habit are consistent in Ireland to live life as it should be: cozy, friendly and usually stressless. “It’s grand” often said when the Irish are happy and well. I am, in a way, Irish. Maybe not genetically. Maybe not due to my heritage. But by heart.